The monument is shown obliquely. A circular pedestal rises in the center of an oblong rocky base. A female genius stands upon it, her left hand lies upon a cinerary urn, her right holds a laurel wreath. Bowls with flames, supported by swans, flank the pedestal. 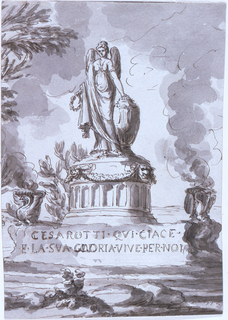 Inscription at the base: CESAROTTI.QV/ CIAGE/ E.LA.SUA.GLORIA.VIVE.PER.NOI In landscape setting. Part of a framing line on top.